The trend in local food consumption has been steadily increasing over the past decade. There has been a significant amount of growth in both direct-to-consumer marketing outlets, such as farmers' markets and community supported agriculture, as well as wholesale procurement. Harvest NY Specialists foster this continued growth through innovative programming and targeted business development consultations. With education and outreach on market readiness, good agricultural practices (GAPs) and operation develop, Harvest NY provides support to farmers to understand and implement changes to mitigate the barriers that often stymie the ability of small farms from participating in larger and more diversified markets. One of the ways farm to school (F2S) is delivered in Buffalo Public Schools is through a Harvest of the Month Program. 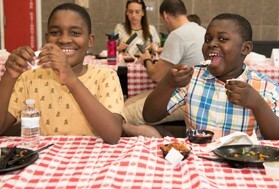 Recognizing early that it wasn't enough to simply menu new F2S recipes, the Buffalo Farm to School team, through the support of a local graphic designer, developed Harvest of the Month posters, infographics and nutritional newsletters, specific to items we grow in NY and serve in our cafeterias. Branded initially for Buffalo, we have created a generic version of all the materials, so schools across NY can access and use at their pleasure. Harvest NY has compiled a list of Farm to School Support Service Providers. The list contains people and organizations that can help advance F2S in a multitude of different ways including, but not limited to (1) F2S program development, (2) assistance with finding and getting NY farm products, (3) menu (re)development that incorporates NY farm products, and (4) best practices to bridge the 3C's of F2S (cafeteria, community, classroom). People listed serve in various geographic capacities, ranging from statewide support, to regional support, to county-specific support. A produce auction is a wholesale market for regionally grown produce. Currently there are eight produce auctions in New York State offering a wide variety of produce at competitive prices. This guide will provide basic instruction on the terminology of the auction, as well as how to purchase produce at these unique markets!